Today, the world remembers the end of World War I. 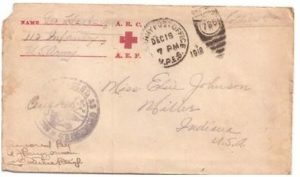 Although no veterans or civilians are with us to recall the atrocities, the record of their experiences lives on through letters, diaries and recordings. 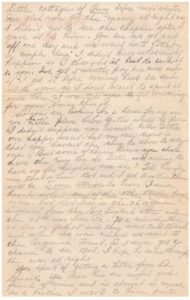 I am in possession of a collection of letters and wanted to mark the 100th anniversary by sharing one with you. With the United States Congress declaring war on Germany on April 6, 1917, 2.8 million American men were soon to be drafted to serve in what was then called “The Great War.” Hoosier born George Bryant Harbaugh, a 22-year-old Deputy Sheriff with the Elgin, Joliet & Eastern Railway in Gary, Lake County, Indiana, was sent to Camp Taylor, Kentucky for basic training. 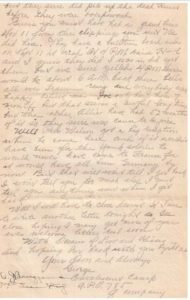 Army Private George left behind his sweetheart, Elsie Wilhelmina Johnson, a 21-year-old Mother’s Helper living in Miller, (now Gary), Indiana. You ask when you may expect me back. That is hard to tell. We may leave here tomorrow and may be here a month yet. My Division the 28th , is in the Army of Occupation and is in Luxemburg I believe, but they say we can’t get back to our old companies anymore but are to go in Casual Companies and go home but just how soon, we don’t know. But I think I’ll be back before March and when I get to New York, I’ll send you a telegram about when you can expect me. I’m sure anxious to get back and I’m sure we can be nicely settled in that little cottage of Ours before next winter. I’m glad you got the money all right as I didn’t get to see the chaplain after I gave it to him. You see, we got paid off one day and we went into battle in a couple of days. I didn’t know what might happen so I thought it best to send it to you. I’ve got 5 months’ pay here now and if I get it before coming back, I’ll send it to you as I don’t want to spend it over here. I wanted you to get something for your Xmas, though. So, you are looking for a house for us, are you? ha. ha. The place below Gertie would be fine. I didn’t suppose you would tell Gertie our happy secret but my only regret is that you haven’t the ring, too. So Gertie was willing to have us for neighbors, was she? Tell her for me that when Bob and I get together there will be some stories to hear. 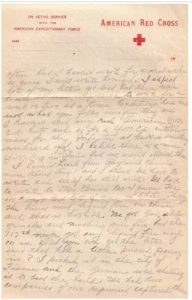 I never heard where any of the other Miller boys were, but Bob was in the 26, or “Yankee Division”, from the New England states and the 28th was from Pa. We relieved the 26 Div. on July 25 and they went to St Mihael, then Argonne Forest so I never got a chance to see Bob. I hope he came through the war all right. You speak of getting a letter from Ed Lemert. Yes, Dear, he’s an awful good friend of mine and is almost as much as a brother. I wrote to him quite often but I haven’t wrote for several weeks so guess I will write tonight. I expect lots of my letters get lost but there was times it was impossible to write for a week or two at a time. Conditions here are not what you folks imagine they are. I haven’t saw any real American Y.M.C.A. huts and as for a Y.M.C.A entertainment for the Infantry at least, is something unheard of. I believe there is a nice Y.M.C.A.in Paris but we aren’t allowed there. I haven’t heard from Raymond Clemons since about Aug 1 and I believe I’ll have to write and see if he’s still alive. I’ll have to write to Mrs. Clemons, too, I guess. The 111th Regt. lost lots of men at Chateau Therrey. The Huns used liquid fire on them and that is horrible. We got gas, shells, grenades and machine gun fire but the 112th never got any liquid fires used on us. Did you ever get the letter I sent that had a little pressed pansy in? I picked it in the city of Fismes and the Germans were shelling it to beat the band. We had two companies of our regiment captured there but they sure did pile up the dead Huns before they were overpowered. Guess you must have had a grand time Nov. 11 from the clippings you sent. We did here. They have a bulletin board and on Nov. 11 it read “At 4 P.M raise H-l and I guess they did. I was in bed yet then but we sure yelled 4 P.M here would be about 6 A.M. back there. Bells all over France rang and everybody was happy, believe me. I’ve only been here 7 months but that seems an awful long time but the other Allies have had 52 months of it so they sure was cause to rejoice. Well, Pres. Wilson got a big reception when he came here and if it wouldn’t have been for the Yank soldiers. He would never have come to France for it would have all been Germany by now. But that will wait till I get back. I won’t tell you too much else; I can’t tell you anything new when I get back. Well, I will have to close, Dearest, if I am to write another letter tonight so I’ll close hoping I may get more of your ever welcome letters real soon. With Oceans of Love and Kisses and hoping I’m back with you by Feb. 22. 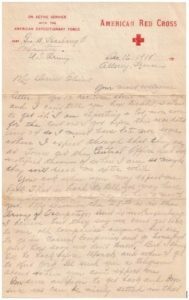 I am currently compiling the letters into an eBook with the working title, Thanks to the Yanks – World War I Letters from a Soldier Boy to his Sweetheart.